Tabernanthe Iboga is native to West Central Africa in the countries of Gabon, Cameroon, and Republic of the Congo.The iboga plant itself looks pretty unassuming in a rainforest full of plants. Typically you will see it from about 1.5 meters tall as an adult up to 10 meters is near perfect conditions. Iboga can be found in the jungle, on the beach and in villages in Gabon. The plant has elongated shiny green leaves, it’s blooming flowers are a white or pinkish. Depending on the species and location of the iboga plant the fruits can be rounder or more elongated at the bottom tip. The fruits resemble the shape of a long drop of water. The root of the iboga plant contain alkaloids such as ibogamine, tabernanthine, voacangine, harmaline and other indole alkaloids of the plant. The most well known of these alkaloids is ibogaine. 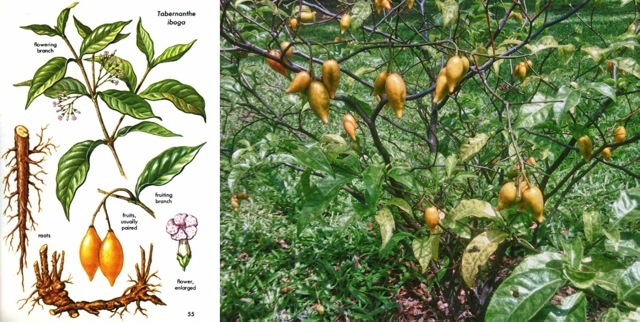 Ibogaine is extracted from the iboga plant or synthesized from the Voacanga Africana plant. Ibogaine is well known for its unique properties that help us humans overcome an addiction. Ibogaine has been used for all different types of addiction but it receives most of its attention for the ability to dramatically lessen or almost completely eliminate opiate withdrawal symptoms. We have a dedicated page on ibogaine here. Iboga is at the center of everything an ancient tradition or religion (depending on who you ask) called Bwiti. The Bwiti are l people that work with iboga and use it as a teacher. Iboga teaches us how to live life and get all we want out of it. Iboga is also used to help opiate and other drug addicts kick their addiction. For opiate addicts on really high doses or heroin, suboxone or methadone you probably want to take ibogaine and be in a setting where medical staff is present in case any complications arise. If you are currently addicted to prescription opiates like Vicodin, Percocet, moderate doses of heroin like 1 grams or less per day, poppy seed tea, kratom, etc. then iboga in TA (total alkaloid) form will be fine for you. If you are a methamphetamine, cocaine/crack, can’t stop smoking, alcohol problems, want to stop SSRI medication, etc. Then iboga is perfect for you. There is in my opinion no stronger aid to end an addiction. Typically when addicts take iboga in a nonclinical settings it will either be the shredded root bark or TA. TA stands for total alkaloid. That means you are getting all the alkaloids of the plant, not just one or two of them. Not all but many non-clinical iboga retreats & treatment centers go this route to work with the “full spirit” of the plant. If you are on a spiritual path then having the spirit of the plant with you will be important. From a physical point of view, it is believed that iboga works by going deep into receptor sites and repairs at the cellular level. Iboga has also used by those suffering from different physical ailments such as; Hepatitis, Herpes, Chronic Fatigue Syndrome, Auto immune Conditions, Human Papilloma Virus (HPV, Chronic Infections, Aerotoxic Syndrome, Chemical Toxicity, Heavy Metal Toxicity, Arthritis, Physical Stress, Eczema, Lupus, Blood Clots, Parkinson’s Disease, Multiple Sclerosis, and Infertility. In the case of Parkinson’s somebody is trying to patent a formulation with ibogaine. Of course, the pharmaceutical industry wants a standard dose of their medicine so ibogaine is used in almost all pharmaceutical compositions. This does not mean that iboga root bark or TA could not work. These are serious ailments and it should always be discussed with the clinic or retreat center beforehand. It should be known that iboga can be dangerous if any sort of SSRI, mood stabilizer or similar “medications” are in the system when iboga is taken. Anyone who has these medications in their body needs to be off of them for a month prior to taking iboga. Iboga has been used by people looking to cure or relieve the following condition below. Depression, Anxiety, Bipolar disorder, Depersonalization Disorder, Body Dysmorphic Disorder, Mental/Emotional Abuse Issues, Mood Disorders, Post-Traumatic Stress Disorder (PTSD), Severe Mental Blocks, Attention Deficit Hyperactivity Disorder (ADHD) and Childhood Emotional Trauma. For spiritual and mental disorders iboga really shines. This author has personally seen huge transformations and seemingly permanent results that have cured people of depression and anxiety type disorders. Much of the success comes down to how we approach life after the iboga experience. The iboga will “rewire” everything on the inside but we have to also do our part and change our habits and old ways of thinking for lasting change. These ailments are can be treated with a high level of success in the proper setting & aftercare.